The Model County earn a 5-point victory at Pearse Park. THEY NEEDED EXTRA-time at Glennon Brothers Pearse Park as Wexford eventually got the better of Longford. There was a lengthy fracas involving players and mentors at the end of normal time following a late Paul Barden miss and the full-time whistle went with the score level at Wexford 2-8 Longford 0-14. But the Model County went on to record a five-point win. It was tight in the opening 10 minutes as JJ Matthews and Adrian Flynn traded points as neither outfit was able to seize control. There were glimpses of Wexford’s attacking potential with Redmond Barry creating chances in a withdrawn role. But Longford were rugged initially and Shane Mulligan ended a sweeping 11th minute move to kick a fine point. That was followed by two splendid Seanie McCormack scores, including one beauty from play before midfielder John Keegan had the locals 0-5 to 0-1 ahead. Ciaran Lyng replied with a free for Wexford, who had plenty of possession, but they weren’t as slick as Longford in front of the posts. Barry Gilleran fisted a point to put Longford four clear again, but Wexford’s James Holmes replied with a smashing effort from distance. Flynn, a highly effective attacking wing back, drilled a delightful point, but Wexford were pegged back instantly. McCormack tapped over a routine free and Michael Brady added one from play ensuring that Longford departed at the break armed with a 0-8 to 0-4 advantage. Four minutes after the restart PJ Banville pounced to net a goal following a smart Damien Sheridan save from Aindreas Doyle. A McCormack free and a brilliant Paul Barden score had Longford 0-10 to 1-4 in front, but Wexford substitute Ben Brosnan responded. But Longford were dealing with Wexford’s revival as McCormack was a potent threat inside for the home side. The midlanders’ were three ahead when McCormack curled over an outrageous point, but Wexford rallied with another goal. Paddy Byrne, a decent target man throughout, fed Daithi Waters, who crashed past the advancing Sheridan. It was intriguing until the end of normal time when it seemed as if Waters had given Wexford a win, but McCormack nailed a long range free to level. Then there was a melee involving both sets of players and mentors which lasted for a couple of minutes before order was resumed. Scorers for Longford: Seanie McCormack 0-7(5fs), Shane Mulligan 0-2, Paul Barden 0-1, JJ Matthews 0-1,, John Keegan 0-1, Barry Gilleran 0-1, Michael Brady 0-1. Scorers for Wexford: Daithi Waters 1-1, PJ Banville 1-0, Adrian Flynn 0-2, Ben Brosnan 0-1, James Holmes 0-1, Redmond Barry 0-1, Aindreas Doyle 0-1, Ciaran Lyng 0-1 (f). Email “Wexford overcome Longford after extra-time”. 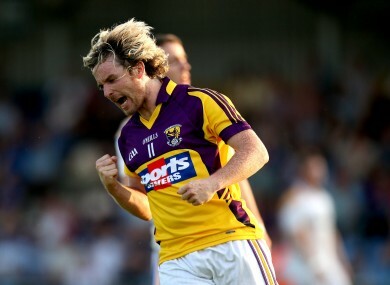 Feedback on “Wexford overcome Longford after extra-time”.